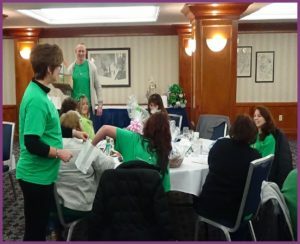 Each year, The Pennsylvania Coalition of Affiliated Health Care and Living Communities (PACAH) hosts a conference for local sponsors, vendors, and affiliates to network and attend informational sessions to further their knowledge in all matters related to the long-term care industry. During the conference, PACAH presents awards to recognize achievements and excellence of various individuals and organizations. 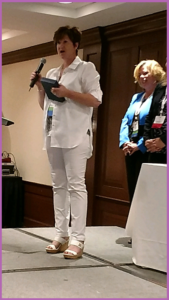 We are proud to announce that Denise McQuown-Hatter, President and CEO of Affinity Health Services was this year’s Friend of PACAH Award winner. 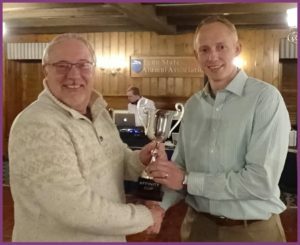 The award is granted to an individual or organization who has demonstrated a continued commitment to the improvement of long-term care and has assisted PACAH members in the performance of their duties, often, above and beyond the scope of normal levels of assistance, enabling member facilities to provide excellent service. 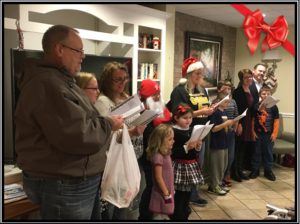 The recipient has shown continued commitment to PACAH and its goals and positions. This is the highest honor awarded to a nonmember and may be made to an individual or company/agency. Congratulations, Denise, on this well earned and deserved award! Denise McQuown-Hatter, President and CEO along with Dana Heizenrater, Clinical Consultant of Affinity Health Services, will be presenting at the 2017 LeadingAge PA “Focus on the Future” Conference, held at the Freemasons Cultural Center of Elizabethtown on November 15th and 16th. Deike Auditorium 1:45 p.m. – 2:45 p.m. Explain the regulatory requirement of Phase II Requirements of Participation, F 838 related to the Facility Assessment. Explore the regulatory implications associated with the Facility Assessment. Identify the fiscal implications on facility operations as a result of the requirements of the Facility Assessment. For those who are new to the MDS Assessment process or who do not actively participate in the Assessment process on a day-to-day basis, this is the perfect opportunity to obtain a stronger understanding of the entire process. Because the data in the MDS impacts so many aspects of the LTC facility, it is important for all staff to have an understanding of how this instrument impacts the functioning of the facility. Participants will be exposed to the financial, quality measures and survey related aspects of the assessment tool. Employed for over 6 years as an Assessment Coordinator in LTC facilities, responsible for completion of and transmission of the MDS to Myers and Stauffer, determined whether residents qualified for Medicare benefits and determined when those benefits were to be discontinued, trained clinical staff in data requirements of the assessment, improved accuracy of Case Mix Index of the facility and maintained a low error rate during the Utilization Management Review process. Successful completion for receipt of the certificate is determined by presenting the completed evaluation form. Partial credit will not be provided for this webinar. 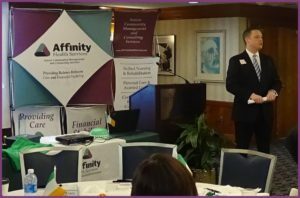 Affinity Health Services recently held a retreat at the Penn State Nittany Lion Inn with their affiliated senior communities. 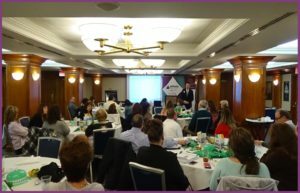 This two-day retreat had a full agenda that consisted of an array of presenters who focused on the changes taking place and the future direction in the health care industry. Attendees took part of a session with a presentation from John Rodgers, CEO of Dale Carnegie, who provided an overview on “How to lead change for less resistance in the workplace.” Another presenter was Brandon Smeltzer, Director of Personal Care and Assisted Living of PHCA/CALM, who provided an update on the current and future environment for Assisted Living and Personal Care across Pennsylvania. Day two granted a presentation from Anne Henry, Senior Vice President & Chief Government Affairs Officer from LeadingAge Pennsylvania. She gave insights on MLTSS and additional changes that are ahead within the healthcare industry. 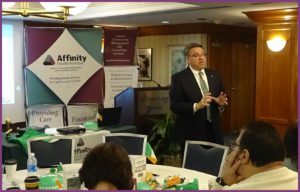 Affinity Days is an annual retreat which also grants attendees an opportunity for peer-to-peer round table discussions regarding the upcoming changes; challenges they are facing; support to one another and to also offered suggestion and best practices. Attendees attentively listen to valuable informative session at Affinity Days 2017. 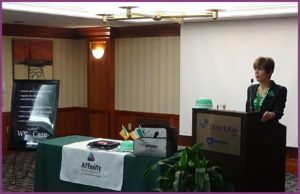 “During this annual retreat, Affinity recognizes and celebrates the many accomplishments that these senior communities achieved over the past year. 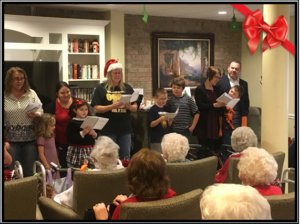 Our senior affiliates continue to show their true commitment and dedication they have for their communities, residents, families and staff,” states Bryan Hagerich, Senior Vice President of Operations with Affinity Health Services. 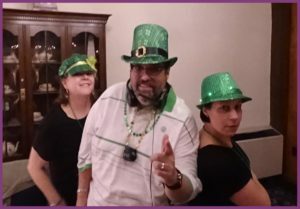 The 2017 Affinity Cup was awarded to Beacon Ridge, a skilled nursing and long-term care community located in Indiana, PA.
Senior Community affiliate also enjoyed the St. Patrick’s Day themed event as well as some team building enjoyment. Pennsylvania clamps a ranking as the fifth largest proportion of senior citizens across the United States. The State Board of Examiners of Nursing Home Administrators develops the standards of professional conduct in order to maintain a high level of integrity and performance in the practice of nursing homes. Indiana County healthcare professional, Kim Cobaugh, RN, MSN, RNC, NHA, was recently elected as Pennsylvania’s Chairperson to the Nursing Home Administrator board of directors for 2017. As Chairperson, Mrs. Cobaugh will lead the board in the development of new talent to establish elite standards of competence of those seeking licensure in the Commonwealth of Pennsylvania; investigate reported misconduct to the welfare of the patients, the staff or the nursing home; and maintain a high level of integrity and performance in the practice of nursing home administration. Senator Don White put forth Mrs. Cobaugh’s nomination for Chairperson. This marks her second term serving as a Nursing Home Administrator board member; each term is four years. For more information about the State Board of Examiners of Nursing Home Administrators, visit dos.pa.gov. Affinity Health Services is honored to have been selected to speak at the 2017 LeadingAge PA Annual Conference at the Hershey Lodge & Convention Center in June 2017. Are We Listening to Our Acute Care Partners? This presentation will define the essential element to blend acute care and post-acute care expertise. During this session precise experiences will be shared with regards to Accountable Care Organizations; preferred provider status for Comprehensive Joint Program; as well as the new and innovative Medical Director agreements, to name a few. In addition, the progression of focus towards Personal Care Home initiatives, the presentation will also provide highlight to continuation of making Personal Care Homes a significant part of the continuum.